To detect and quantify the level of determinism as a measure based approach for characterizing and detecting any changes in the assumed dynamics of brain EEG signals. Hypothesis 1: Recorded EEG signals are combination of both deterministic and stochastic components. Hypothesis 2: A quantified level of determinism can be used to characterize some physiological states of the brain such as the level of abnormality (during or before seizure activity), the level of abnormality in patients with Parkinson's disease or the level of awareness in anaesthesia. A new index of determinism is proposed that can provide a robust measure of the level of determinism. Calculation of this index for short time segments of EEG signals confirms the first hypothesis. The second hypothesis can be tested by calculating the index of determinism for EEG signals of healthy and epileptic patients at different states. EEG signals which are used in this research include the signals that are recorded at EEG laboratrory, Winnipeg Health Sciences Centre, Freiburg Center for Data Analysis and Modeling, Clinic of Epileptology of the University Hospital of Bonn and University of British Columbia. Epileptic EEG is generally more deterministic than healthy EEG. 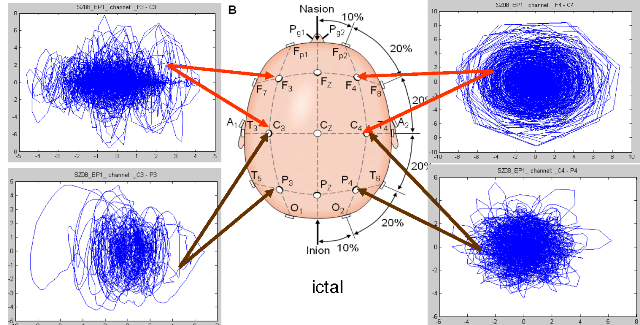 Intracranial EEG is more deterministic than surface EEG. ictal and post ictal EEG is more deterministic than interictal EEG. Healthy EEG may be more deterministic that Parkinson's disease EEG. Antiparkinson medication increases determinism of EEG. Sleep EEG is more deterministic than awake EEG. EEG during anesthesia is more deterministic. Calculation of index for EEG signals of epileptic patients prior and after a seizure is shown for two sample seizures of a patient recorded with intra-cranial EEG. The change in determinism after the seizure is significant in many cases.